Vision is an innovative window blind that features two layers of translucent and opaque horizontal striped fabric. The front layer moves independently of the back allowing the stripes to glide between each other creating an open and closed effect, with limitless light control. A single control chain is used to slide the opaque and translucent woven stripes passed each other. The same chain is used to raise or lower the window blind to any height in the window with ease, in the same way the classic roller blind would. This enables you to soften excess daylight and reduce the glare entering the room. The Vision blind will also roll up fully into the attractive cassette head rail to reveal an uninterrupted view to the outside. 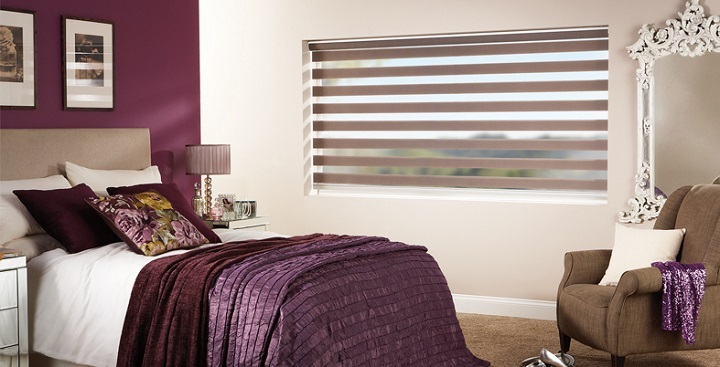 Our sleek cassettes give your Vision blinds a stylish enhancement. Choose either open or closed cassettes in white or black to co-ordinate or contrast with your blind and room decor. For a softer touch you may select a matching fabric headrail insert. For a Vision Blind quote, please fill in the form below and we will get straight back to you.